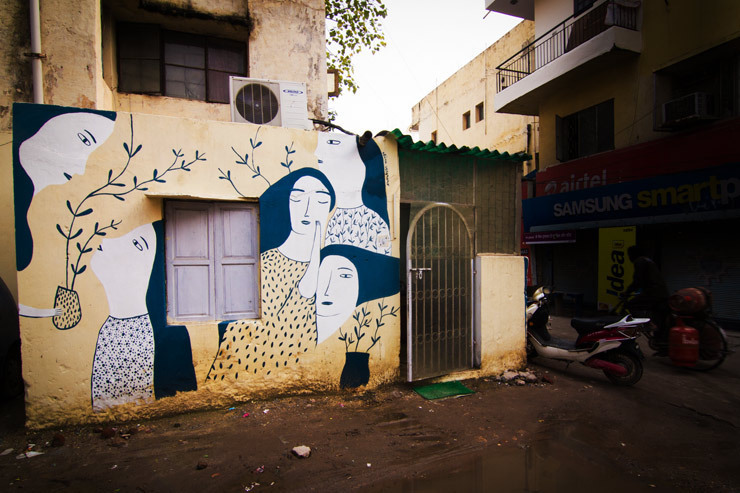 As street art continues to go global here in the twenty-teens, today we bring you images showing that Dehli has become one of the latest cities to showcase it. In what is billed as India’s very first street art festival the south Delhi neighborhood of Shahpur Jat hosted a collection of international and local artists this spring to paint murals while a public who is not quite acquainted with public art asked many questions. Working out of the newly rustic indoor venue “Social Space” in the trendy neighborhood of Hauz Khas Village (HKV), the St. ART Delhieffort was a combination of a gallery exhibition and a street art festival that invited 60 or so international and Indian artists earlier this year to create public works. Overseen by co-founders Hanif Kureshi and Arjun Bahl and curated by Italian Giulia Ambrogi, the festival was possible with the help of a collection of artists, professionals, art school students, and friends who joined with the Goethe-Institut and the Italian and Polish cultural institutes in Delhi. With volunteers, supplies, and a lot of community outreach, the event organizers were able to bring the artists and help get walls for them- an effort which took about a year and a half of serious planning to bring to fruition. Sé Cordeiro. St.ART Delhi 2014 (photo © Akshat Nauriyal)In an underdeveloped area undergoing the same gentrification found in edgy parts of large cities around the globe, the artists found that the long term residents sometimes resisted the change but eventually embraced it, if tentatively at times. “Pondering was what we had to do for much of the day as the locals were still getting accustomed to strange folks painting their walls and generally made life a bit difficult for the artists and the crew,” writes Siddhant Mehta on the blog of the festival’s site when describing the cautious reaction of folks when seeing painters and scaffolding. Some residents even requested images of religious iconography before any artworks were created, while some artists entertained requests for cartoon characters or children’s games to be incorporated in their murals. Sé Cordeiro. St.ART Delhi 2014 (photo © Akshat Nauriyal)Co-founder and typography designer Kureshi freely admits it was an easy non-controversial choice when deciding on the portrait that went up on the police building. “After two months, we finished around 75 pieces around Delhi including the tallest one on the Delhi Police Headquarters,” says Mr. Bahl as he describes the tallest portrait of Mahatma Gandhi anywhere which covers 150 by 38 feet — a collaboration between Indian painter Anpu Varkey and German street artist ECB. Of the 60 artists who participated, many were from India, which may have contributed to a sense of cultural balance in the mural collection created in the neighborhood. Whether is was TOFU from Germany, M-City from Poland, or Alina from Denmark, many of the artists reported that small crowds gathered to watch and, with time, offered gifts such as peanuts or a cup of chai to their foreign guests. As the global street art scene continues to open its arms wider it is promising to see that a new public art festival like this has begun in such a grand way in a brand new location. It is also heartening to see planners who take into account the preferences of the neighbors, and who act with a sense of goodwill when offering public art for arts sake. Harsh Raman. St.ART Delhi 2014 (photo © Akshat Nauriyal) Okuda. St.ART Delhi 2014 (photo © Akshat Nauriyal) Andy Yeng and Tofu. St.ART Delhi 2014 (photo © Akshat Nauriyal) Tofu. Detail. St.ART Delhi 2014 (photo © Jayant Parashar) Tona. St.ART Delhi 2014 (photo © Akshat Nauriyal) Foe. St.ART Delhi 2014 (photo © Enrico Fabian) Foe. St.ART Delhi 2014 (photo © Akshat Nauriyal) Mattia Lullini. St.ART Delhi 2014 (photo © Akshat Nauriyal) Alina Vergnano. St.ART Delhi 2014 (photo © Akshat Nauriyal) Alina Vergnano. St.ART Delhi 2014 (photo © Pranav Mahajan) Bond. St.ART Delhi 2014 (photo © Akshat Nauriyal) Alias. St.ART Delhi 2014 (photo © Akshat Nauriyal) Alias. St.ART Delhi 2014 (photo © Akshat Nauriyal) Tones. St.ART Delhi 2014 (photo © Akshat Nauriyal) Tones. St.ART Delhi 2014 (photo © Akshat Nauriyal) Tones. St.ART Delhi 2014 (photo © Akshat Nauriyal) Ranjit Dhaiya. St.ART Delhi 2014 (photo © Akshat Nauriyal)BSA extends our thanks to Thanish Thomas for his diligence in getting these images to us and to Hanif Kureshi, Arjun Bahl, Giulia Ambrogiall, Mridula Garg, Akshat Nauriyal, and the entire team at St.ART Delhi 2014. Click HERE to learn more about St.ART Delhi 2014.